Welcome to Gundog Theft Awareness! Welcome to Gundog Theft Awareness Week. Part of the Pet Theft Awareness campaign. Q.Why the need for a Gundog Theft Awareness website? A. 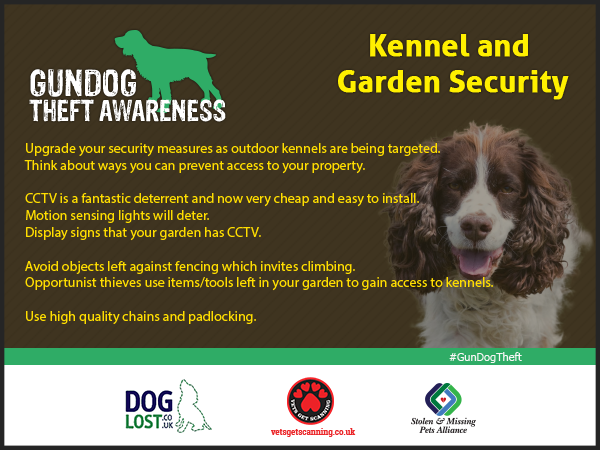 As 50% of stolen dogs are “working” gundogs, Pet theft Awareness recognise the need to differentiate between the theft of these dogs and other dogs although many of the reasons for stealing them are similar the opportunities of theft are different. To prevent theft through awareness. To offer advice to victims. To campaign for the re-classification of dog theft and for stronger and tougher penalties to deter dog theft including custodial sentences. Also visit The Stolen and Missing Pets Alliance website.